To create this card first, I did embossing using Damask embossing folder from Close to my heart and my big shot with white card stock. 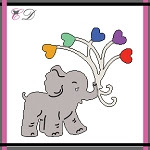 And then, I die cut the elephants on the pastel color card stocks and die cut the heart parts with red card stock. I cut and made hearts from red die cut and adhere on the elephants die cut the heart parts. I mounted all elements as shown a top-folded card stock with double-sided tape.